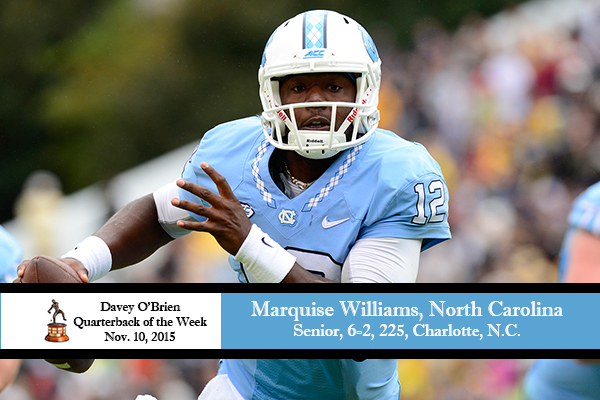 FORT WORTH, Texas (Nov. 10, 2015) – North Carolina senior Marquise Williams’ school-record setting performance has earned him Davey O’Brien National Quarterback of the Week accolades for week 10. Williams, the ACC Offensive Back of the Week, established school records in both passing yards (494) and total yards (524) in the Tar Heels’ 66-31 win over Duke. In addition, he accounted for five touchdowns, including four through the air. The 524 yards, which included 404 passing yards in the first half, rank as the sixth-most in ACC single-game history. Among his four touchdown passes were scores that covered 89, 74 and 49 yards. The native of Charlotte, N.C., is now responsible for a school-record 83 career touchdowns (52 passing, 28 rushing and three receiving). In 2015, he ranks eighth nationally in passing efficiency (165.3), 21st in total offense (297.2) and 23rd in points responsible for (132). Williams, who was named to the Davey O’Brien watch list in the preseason, is a first-time weekly recipient. He is the first player from the ACC to be honored since Clemson’s Deshaun Watson on Sept. 30, 2014. All 128 FBS quarterbacks are eligible for the weekly award, which is determined by a subset of the Davey O’Brien National Selection Committee. The other “Great 8” quarterbacks in week 10 were: Brandon Allen of Arkansas, Washington State’s Luke Falk, DeShone Kizer of Notre Dame, Michigan’s Jake Rudock, Mason Rudolph of Oklahoma State, Baylor’s Jarrett Stidham and Watson.